Join us for the Central Moraines Chapter’s inaugural Hike-A-Thon! 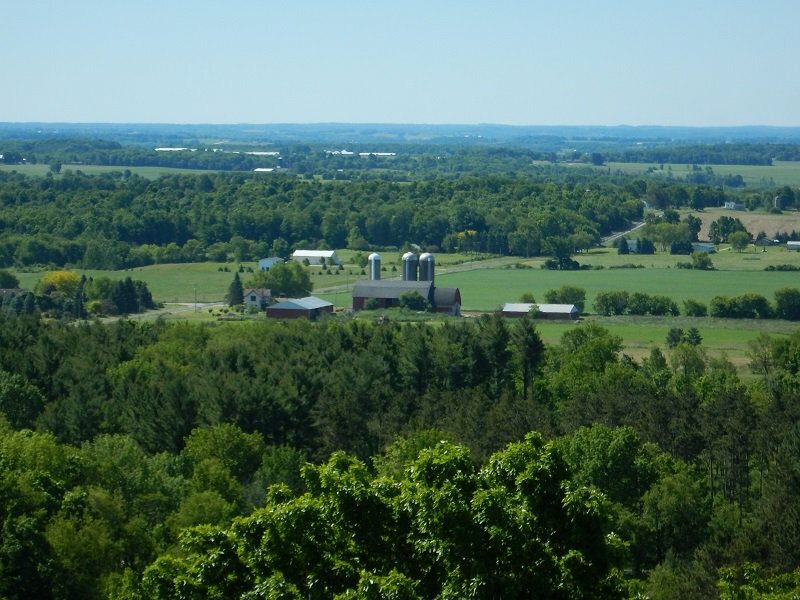 In celebration of National Trails Day (Saturday, June 8th, 2019), join hikers, friends, family, and colleagues to explore the Ice Age National Scenic Trail in Marathon County and raise funds to build, maintain, and protect the Trail. Our goal is to work together to raise more than $3,000 for the Central Moraines Chapter of the Ice Age Trail Alliance. We are asking all participants to make a tax-deductible gift or collect pledges of $20 or more (individuals) or $30 or more (families). Those who are not currently Alliance members who donate or raise $50 or more have the option to start a one-year Alliance membership. To register yourself for the event or to make a gift in support of someone else, please follow the link at the bottom of this page. Shuttles and refreshments will be provided. Participants should check in anytime between 9 and noon on the day of the event. Check-in headquarters will be at the Plover River Segment’s County Road HH parking lot (driving directions). Thanks to these local businesses for supporting and sponsoring the 2019 Hike-A-Thon! In the event of severe or threatening weather, we may need to cancel the Hike-a-Thon at the last minute for safety reasons. If this happens, we will be unable to refund donations. Pets are welcome but must be on leash at all times. Popular Hike-A-Thon is back for 2019! In celebration of National Trails Day, join hikers, friends, family, and colleagues on the Ice Age Trail to explore Dane County and raise funds to build, maintain, and protect the Ice Age National Scenic Trail. Over the last 7 years, the Hike-A-Thon has raised more than $30,000 for the Ice Age Trail Alliance and its Dane County Chapter. In 2019, our goal is to work together to raise more than $6,000 for the Ice Age Trail Alliance. We are asking all participants to make a tax-deductible gift or collect pledges of $30 or more ($40 after May 24th). The first 72 participants to register will receive a pair of Wigwam socks courtesy of Fontana Sports Specialties. Those participating in the 20-mile Hike-a-Thon will meet at 8 a.m. at Badger Prairie County Park, in the parking lot adjacent to Shelter #1. Park entrance is at 4654 Maple Grove Drive, Verona (driving directions). Buses will leave at 8:30 a.m. to take you to the start at the Brooklyn State Wildlife Area. Bring a lunch and at least 16 ounces of water. We will provide three (3) water stops with snacks every 3-5 miles. Porta-potties will be available along the route. Those participating in the 5-mile Prairie-to-Prairie Hike will meet at 12:30 p.m. at Badger Prairie County Park, in the parking lot adjacent to Shelter #1. Park entrance is at 4654 Maple Grove Drive, Verona (driving directions). Buses will leave at 1 p.m. to take you to the start at Prairie Moraine County Park. Bring at least 16 ounces of water. We anticipate that participants from both hikes will arrive at the finish line at Shelter #1 together starting around 3:30 p.m. There will be refreshments, snacks, and a celebration! Please bring a folding chair if you plan to stick around for the party. In the event of severe or threatening weather, we may need to cancel the Hike-a-Thon at the last minute for safety reasons. If this happens, we will be unable to refund donations. If the cancellation of the event is necessary due to weather, every effort will be made to contact all participants by email on May 31st. We love dogs, but please leave yours at home for this event. National Trails Day is Saturday, June 2nd, 2018 and there is plenty to celebrate along the Ice Age National Scenic Trail. Celebrate Spring with a Hike! As the snow melts, trees bud out, and wildflowers begin adding a glimmer of color to the Trail, chapter-led hikes begin populating the Ice Age Trail Alliance calendar in earnest. Beware of Icy Hiking Conditions! Icy trail conditions like these along the popular Straight Lake Segment of the Ice Age National Scenic Trail call for winter traction devices! Photo by Dave Caliebe. Don’t put summer fun in jeopardy by taking an otherwise preventable fall on an icy trail. Many favorite, well-loved, and well-used segments of the Ice Age National Scenic Trail become extremely icy during the late winter and early spring. Snowy trails, packed down by many feet, turn to ice and become even more dangerous as balmy daytime temperatures lead to thawing and evening temperatures dip back into freezing range. Clicking on a feature in the map will bring up more information, such as the name and length of an IAT segment. The NEW interactive Hiker Resource Map shows all official Ice Age National Scenic Trail segments and (unsigned) connecting routes, and additional features such as camping, parking, water, ColdCache sites, and Ice Age Trail Communities. The map works on computers and mobile devices. Boost your happiness; immerse yourself in a healthy dose of nature (vitamin Green!). Welcome 2017 with a dose of fresh air. Say good-bye to the holiday cookies and chocolates. 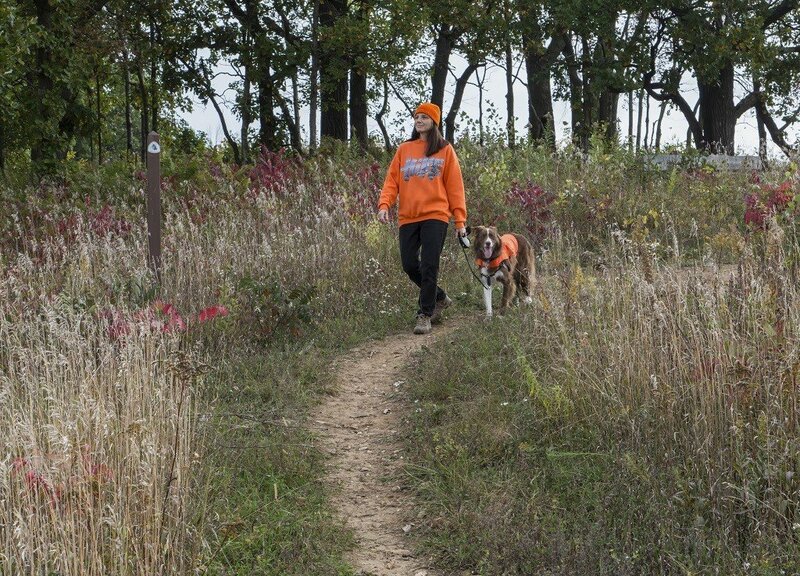 Burn a few calories with a fun, relaxed-paced, yet blood-pumping hike on the Ice Age National Scenic Trail. Photo credit: Dave Caliebe – Wood Lake graced by a Bald Eagle and two Trumpeter swans. Taylor County, sculpted by the powerful forces of glacial ice, is known for its undulating, hummocky terrain and smooth-as-glass kettle lakes reflecting sky and clouds, is already beautiful, and last week, it just got more attractive. Did you know, world famous glacial landscape features are within an easy drive from your front door? This might not seem like such a big deal until you consider that walking across the high ridge of an esker, or peering down into a kettle lake is a bit like time travel, giving you a peek into how the landscape of Wisconsin was formed. Have you ever, while hiking along the Ice Age National Scenic Trail, found yourself standing in awe, exhaling a huge sigh, your heart filled, and knowing there were simply no words for the beauty you were witness to? Perhaps, in the next moment, you whipped out your phone, or dug around in your day pack for a camera, sincerely hoping the adage, “a picture is worth a thousand words” was true and you could adequately capture the way the sun slants golden across the field; the way the trillium spreads across the forest floor, a delicate white carpet fit for a fairy queen. Perhaps you sought to hold on to the expression of sheer happiness on your hiking partner’s face and his or her wind-tousled hair. Do you lack a reliable sense of direction? It can be a seriously annoying trait when you’re driving, trying to get somewhere on time. It can induce a panicky feeling when you are out in the woods and there’s only a few hours of daylight left to locate a camp site and pitch your tent. If you can relate to the cartoon above, then hopefully, you and Siri, are good friends by now and she’s helped you navigate, turn-by-turn, to your various destinations. This is what happiness looks like: sunshine, fresh air, muscles put to good use, and the satisfaction of a job well done! The boundless energy of kids. We all wish we had a bit more of it ourselves. Perhaps you’ve even wished you could harness it. What if you could focus all that energy and unleash it like a super power, in service of a better, brighter world? There can be a lot of details to navigate when you hike the Ice Age Trail in Wisconsin’s fall and winter seasons: hunting season dates, trail closures on private property, and public lands where the Trail is open and hunting is also allowed.